This blog has been designed to offer my students of English as a foreign language in Argentina a new tool to learn. However, this is also a useful resource for all students and teachers of English. You will find activities specially designed for secondary school students that will enlarge their knowledge of the language and will empower them through practice. Grammar explanations, photos, videos, and a lot of activities are part of this blog. Feel free to surf and enjoy it! Can't Stop the Feeling was released on May 2016. Justin Timberlake, the singer, put on his dancing shoes to pen this good tune with Max Martin. 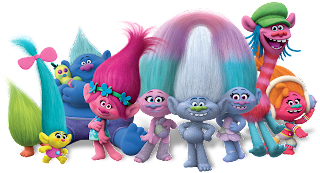 The song is the soundtrack of the animated movie Trolls. Timberlake also provides the voice of a grumpy-looking grey-blue troll called Branch in the Dreamworks film. And now click HERE to start working with the song!! Let's do it with Lyrics Training! Click HERE and get fun!!! Let's watch at the official Dreamwork's Trolls Trailer! The two main characters in the movie are just like Shrek and Donkey. Branch is like Shrek: he is grumpy, short tempered, and likes being alone. Poppy is like Donkey: she is possitive, talkative, and annoying! Both Poppy and Branch are polar opposites who go on a journey together and probably will become good friends in the end. So this movie is like Shrek but with trolls and no princesses or fairytale characters! Teacher of English specialized in English Language (UTN). I work as a teacher for state and private secondary schools and I hold the position of Headmistress in a Public School. I'm a post-graduate student in Educational Managment. In matters of thought and conduct, to be independent is to be abnormal, to be abnormal is to be detested.